When it comes to idling your vehicle, there are plenty of misconceptions. Click on a myth below to learn the truth! MYTH: Pollution emitted from idling vehicles is insignificant to my health and the environment. FACT: It's actually quite significant. One minute of idling produces more carbon monoxide than the smoke from three packs of cigarettes. The toxic air pollutants emitted from idling can impair our lungs and heart, and exhaust fumes have been linked to asthma, decreased lung function, cardiac disease, cancer and other serious health problems. Kids, the elderly and folks with respiratory ailments are especially at risk. Idling just one car for five minutes per day can emit as many as 25 pounds of harmful air pollutants and 260 pounds of carbon dioxide a year, the primary greenhouse gas. Throughout the Denver Metro area, idling is responsible for an estimated 40,000 tons of harmful air pollution a year and 400,000 tons of CO2 emissions. This results in over 40 million gallons of fuel wasted while idling, costing area residences and businesses over $100 million dollars a year. MYTH: Idling is good for my engine. FACT: An idling engine is not operating at its peak temperature, which means that fuel does not undergo complete combustion. This leaves fuel residue that can deposit on spark plugs and increase fuel consumption by up to 5%. Also, water condensation in the exhaust system can reduce the system's life. MYTH: Eliminating unnecessary idling won't save me money. FACT: One hour of idling can burn up to one gallon of fuel. Most drivers end up wasting 1-2 tanks of fuel per year due to idling. Avoiding five minutes of idling each day can save $35-115 every year, depending on the size of your gas tank. When you idle, you get 0 miles per gallon. Talk about money going up in smoke! 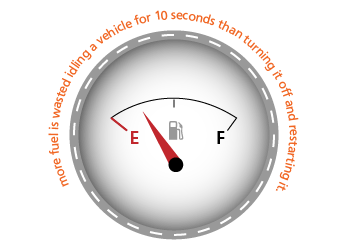 MYTH: It wastes more fuel to restart my vehicle than it does to leave it idling. FACT: For cars with fuel injection (which includes almost all vehicles built since the late 1980s), idling for even 10 seconds uses more fuel than restarting the engine. In fact, Ford Motor Company recommends that drivers "turn the engine off when stopped for more than 30 seconds to save fuel and reduce exhaust emission." Of course, we do not advocate turning your engine off while waiting in normal traffic. That's not a safe opportunity to prevent idling. MYTH: I should turn my engine off at traffic lights and stop signs. 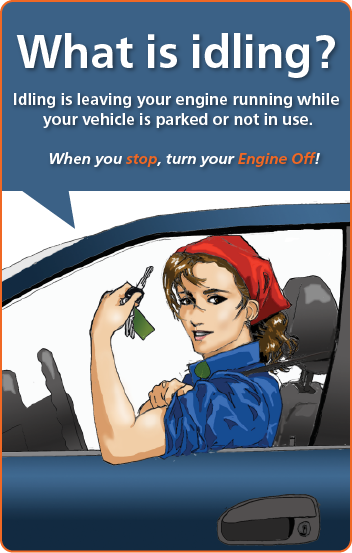 FACT: While your vehicle is idling during short stops for red lights and stop signs, this is not a safe opportunity to turn your engine off to protect air quality. The Colorado State Patrol and Engines Off Colorado discourage drivers from turning their engines off on active roadways because you cannot predict how quickly you will have to move again. But, you can still safely avoid voluntary idling in common situations, like warming up vehicles in the winter and waiting to pick up passengers. MYTH: Shutting off and restarting my vehicle is hard on the engine. FACT: Again, Ford Motor Company recommends turning the engine off, even for stops of 30 seconds, to save fuel, money, and air quality. They have said, "Frequent restarting has little impact on components that include the battery and starter motor." Component wear caused by restarting the engine is estimated to add $10 per year to the cost of driving, money likely to be saved many times over due to fuel savings from less idling. MYTH: I need to warm up my car for several minutes in the winter. FACT: Idling is not an effective way to warm up your vehicle. Modern engines only need to warm up for 30 seconds on cold days. Idling is a slow and ineffective way to warm up your engine. Furthermore, idling your car for several minutes before driving creates extra air pollution, since your car's catalytic converter is not effective at reducing the pollution in your car's exhaust until it is sufficiently hot— generally only after driving a few minutes. The best approach is to only idle for 30 seconds, and then just drive gently for the first few miles. And whatever you do, don't leave your car running unattended. During the winter months, thieves are on the lookout for cars left idling in driveways, alleys, and at convenience stores—and they're ready to hop in and drive away in your car! Denver Police can ticket you for leaving a running vehicle unattended. EXCEPTIONS FOR EXTREME COLD TEMPERATURE: Many idling regulations include exemptions for the cold temperatures that are common in Colorado's cold winters. For example, the City & County of Denver's idling ordinance provides exemptions if the ambient temperature has been 20 degrees or colder for the last 24 hours or 10 degrees or colder for the last hour – but this generally occurs only 10-15 days per winter.